To provide the best-in-class service, you need a network that provides the reliability, manageability, and security your team requires to be productive and your customers expect. When you partner with Netmon Services for network architecture, design, and deployment, you get a dedicated team of professionals who will provide the expertise your business needs. When Do I Need Network Architecture Design and Planning? Are you experiencing slow network speeds? This is the most noticeable sign that your network may need better architecture and the most common headache for many organizations. Slow performance from your network could be a sign that network traffic is not prioritized for critical applications across your network or there are processes that are monopolizing your bandwidth during peak working hours. What ends up happening is all the traffic on your network is trying to take the same pathways all at once. Similar to congested road traffic trying to merge into one lane, bottlenecks will inevitably cause slow downs. We can determine the root cause of your performance slow downs during a network assessment and provide the network design and architecture solutions that address these issues once and for all. Are you developing a new network? If your organization is in the process of planning a move or acquiring a new location, this is the perfect time to consider involving a professional team to help design or completely develop your network. The planning, design and documentation of your network will affect almost every part of your business for years, and even decades, which is why is it critical that it is done professionally and held to the highest standards. 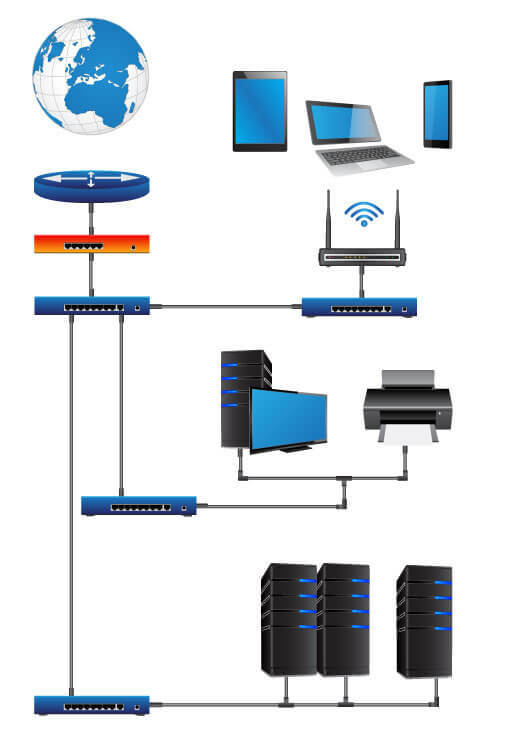 Designing and implementing new networks from the ground up requires a lot of attention to detail in order to match your business's current needs and long-term goals with the right technologies and proper configurations. Our network engineers will work with your business to ensure that your network is planned to provide the highest standards to achieve maximum availability for your business to function today and is scalable to meet the needs of tomorrow. Are you upgrading and scaling network operations? Expanding your network to scale up your operations is not as simple as just adding new devices. Network expansions should always begin with assessing the current network design in order to document the current environment, identify shortcomings and assess the backbone of the infrastructure you are planning to expand on. Network scaling strategies require considerable upfront planning, systematic evaluation and coordination. If your current network is failing to perform or meet your growth needs, expanding with new technologies improperly is going to make problems worse. What sets us apart from other network consultants is that we have a team of seasoned networking professionals who can plan your network expansion, and deliver full-scale enterprise deployments, all with a clear vision of what your organization needs to accomplish. Let us guide your team through the complex scaling process with our enterprise-level consulting and proven processes to deliver the most value for your business expansion. Are you experiencing network security issues? If you’ve experienced network security issues before such as malware, viruses, or ransomware spreading through your network from one machine to the next, it could mean that your network is not configured correctly to block this type of spreading. Proper hierarchical network design works to control how data is able to move across your network and the types of data that can pass through the layers between your core network and end-users. Managing access to your critical data is extremely important because it filters out many security concerns throughout the levels of your network. Beyond just having anti-virus software on your PCs and Servers, proper network security also incorporates centralized anti-virus, anti-spam, content management, intrusion detection and firewalls deployed between layers on your network to prevent unwanted traffic from penetrating to your core services. We can work with your organization to deploy comprehensive security measures into your network and eliminate the security risks that cause downtime from unwanted and malicious traffic by controlling your network for legitimate uses. Our Network Architecture and Design services will help you build a reliable, cost effective, manageable, secure and scalable network that is tailored to meet your business needs. We'll work with you to design and engineer, procure, implement a complete network and system solution that is built on years of experience and focused on your end goals. We first start off by defining the business goals and critical services you want to achieve from your network. Working with your team we gather data about the configuration and performance of your current network in order to determine what changes are necessary to reach your goals. Once we have how your network is performing and defined your business goals we can begin working with you to plan a complete network architecture solution. During this process, we focus on developing recommendations from our assessment. We take into account your current network, business goals, and your budget to plan a comprehensive plan that is built on our network design principles for availability, manageability, scalability, and security. Once the plan is set we work with your team to implement the changes on your network along with the necessary training and full documentation of the changes made, logins, and the discoveries we found during our assessment. Our team won’t just set it and forget it either, we maintain observation of the changes to your network over a period of time to ensure that everything is working as designed. As part of our network architecture and design planning services, we can provide additional help to your staff in the design and deployment processes or completely manage your project and develop your network for you. We tailor our services to your needs. Our expert and dedicated IT professionals work with you and your team every step of the way to ensure detailed planning and project success. A full assessment of your current network along with developing comprehensive documentation of recommendations. A comprehensive network design strategy sets out the plan for your network architecture. We will configure your network based on the network architecture planning provided and ensure that is it working as designed. Yes, at the end of the project we will maintain observation of your network for a designated time period to ensure that it is working as designed. We also provide any necessary training to your staff so that they can be well informed and productive; along with full documentation of the changes made, logins, and the discoveries we found during our assessment. If your organization would like to continue with our monitoring and services we can arrange a managed IT services contract that will provide extended monitoring and maintenance support. Contact us today to schedule a consultation. Let us help you plan and design a network that is tailored to your business needs and achieve the best return on your technology investments. Whether your business is opening a new location, or updating existing computer networks Netmon Services has the experience and staff to make it happen. Netmon Services has over 10 years experience helping businesses in Windsor Essex County and Southern Ontario. Our Computer Networking services will help you build a reliable, cost effective, manageable, secure and scalable network that is tailored to meet your business needs. We'll work with you to design and engineer, procure, implement a complete network and system solution that is built on years of experience and focused on your end goals.